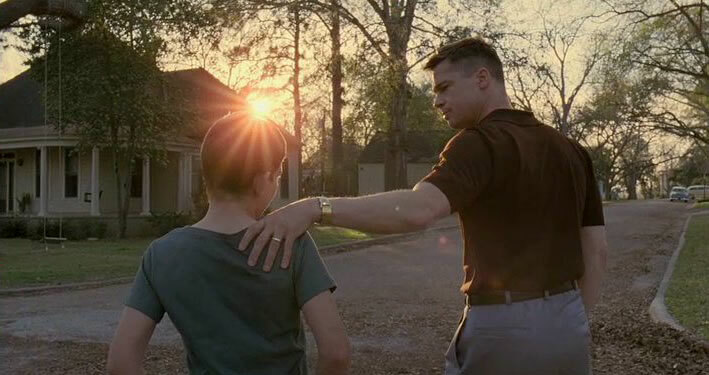 As most people probably do, I followed up my viewing of MEN IN BLACK II with Terrence Malick’s opus TREE OF LIFE. I throw around words like ‘unique’ or ‘original’ or ‘different’ on these pages fairly regularly. If I’m going to use those words to demonstrate, for example, how FUNNY PEOPLE bucks the three-act script structure, or how CATFISH blurs the lines between documentary and fiction, then I better be prepared to use the word ‘revolutionary’ when describing TREE OF LIFE. Because while FUNNY PEOPLE or CATFISH may have unique qualities, they still are recognizable as modern narrative movies. TREE OF LIFE, however, is something else. Closer in structure to a film like KOYAANISQATSI than those other films, TREE OF LIFE is the most ambitious major theatrical release I can remember. Ahhh… but is it any good? I watched TREE OF LIFE (2011) on 5.7.12. It was my first viewing of the film. I’m not afraid of spoiling this movie, because the experience of TREE OF LIFE is not hinged on the qualities of its narrative. I do, however, warn (the three people who may read this) that what follows is how I see this film. When I was getting my film degree, I would feel the need to do research after watching a movie of this sort, in order to ensure that my reading was ‘right’. I’ve since learned how silly that is. I know how this movie made me feel and how it spoke to me. While I think there is value in seeing what others thought, I wanted to put all my ideas down first as to not cloud my judgment with others’ interpretations. In short, let me recommend you see this movie without learning about the film (and, perhaps, without reading this article), so that you may draw your own conclusions regarding its many mysteries. On the surface, TREE OF LIFE is about a small family in a suburban town in Texas. We follow one boy in particular who has issues with his father, played by a dour Brad Pitt. That boy later grows up to be Sean Penn, who we spend a little time with as an adult. But none of that really gets going for the first 45 minutes. First we learn of a tragic death. Some voice over provides us with glimpses inside these characters’ heads as they consider God, or blame God, or try and find answers from God. Most of what people say on screen is muffled, barely important to what Malick is conveying. In fact, the only thing which I can recall clearly being stated (other than the voice overs) is a list of clichés spouted by a woman as she tries to console a grieving mother. Words, in what qualifies as the first two movements of this film, are not vital to understanding. The style is all quick edits and juxtaposed images. Past with present, trees with humans, water with fire. If that isn’t odd enough, Malick breaks away for twenty minutes to show us the birth of the universe and the history of Earth up to 20th century suburbia. At first it is difficult to tell if these are images under a microscope or images of the entire universe (the relativity of size is a major visual motif in the film). But it soon is clear we are seeing the expansion of the universe, then the birth of life on Earth, then a moment of decency as a dinosaur makes a conscious decision not to kill another dinosaur. We work our way back to a somewhat normal narrative at about the 45 minute mark. But that narrative is less about events and more about eliciting a response from the audience. Several minutes are spent showing the birth of a child through the early years of his life. The moments selected are universal human moments. The child getting hurt, the child playing with toys, disobeying in a minor way. All things that, as a new parent, I easily identified with. As we finally arrive at our major story, with three brothers living their life while sometimes fearing their father, we settle into a structure. We can hear the dialogue now, though it is often disjointed. We often break away for a shot as seen from the mind of a character, though perspective is a big question mark. Sometimes we see from the boys’ eyes, sometimes the mother, sometimes the father, sometimes the universe. The question of God is the major theme of the movie. Who is God? What is God? The film opens by telling us that there are two paths in life, that of grace and that of nature. The narrative presents us with the father (who, we learn, we mustn’t call Dad) as our representative of ‘Nature’, and the mother as ‘Grace’. Neither is infallible. Nature is gruff and unyielding, volatile and unpredictable. Grace is passive and unable to be happy in the presence of unrelenting Nature. When they struggle, Nature wins. I’m sure conclusions a viewer while derive regarding TREE OF LIFE’s stance on God and Heaven are varied. The film works as a mirror that way, allowing you to draw your own conclusions as to what has transpired and why. For me, the film seems to take the view that ‘God’ is as much in the birth of the universe as in the death of a child or the mowing of a lawn. God hasn’t changed. God was there when one dinosaur spared an0ther (though the spared dinosaur didn’t thank God). Much time is focused on the central characters’ pleading with God, or questioning God. No answer comes. Because God is not a being which has the human traits of compassion, or empathy, or emotion. God, the film theorizes, is merely that proper mixture of Grace and Nature. The question of Heaven is brought up at the films’ end. Though what exactly we are seeing is ambiguous. For me, the view of Heaven presented is personal. Sean Penn sees himself as both a young man and as his older self. He sees his mother as he did as a child, though it would seem she is also a young girl in her view. People wander, happy, in a simple outdoor environment. Is this Heaven? Or is this Sean Penn’s character thinking on the people in his life, making what we see nothing more than the view inside his head? After these sequences, we cut back to Penn alive in the real world. Does this suggest oneness of time (remember, this is called TREE OF LIFE, not TREES OF LIFE, despite the fact that multiple trees, from various times, fill the titular role), or does it suggest it was all a glimpse into his thoughts? For me, this is the most ambiguous sequence of the film. Yet it is somehow a gratifying conclusion. There is much to be discovered outside the questions of God. Issues of familial roles, the development of violent or sadistic behavior, the ability to age well, middle class struggles, and sexual curiosity are all explored (among many other themes). And while the focus tends to be on the eldest son and his struggles to overcome his father issues, and what those issues have done to his personality, another major conflict has to do with Brad Pitt trying to find his Grace. The film is filled with moments of missed compassion. Sometimes the father tries to be gentle with his son, and the son is uninterested. Sometimes the son tries to warm up to his father, but the father is cold. The climax, then, comes in a moment of shared openness. It’s a moment which (somehow) is more subtle than it appears to be. Not enough can be said about the beauty of the cinematography and the use of sound. I described the film in movements, above, and I feel that this is proper. TREE OF LIFE has beats separated by small adjustments in narrative. These sequences are not representative of the normal three act structure of a film script, instead flowing the way a symphony might. At several moments, I thought this film would be something I could play at night without any picture and just listen to. The mixture of music, diagetic and non-diagetic sounds, and dialogue is just beautiful. The acting is phenomenal, Brad Pitt’s best and most understated work. The kids’ are natural in a way which makes it possible to forget you are watching a directed actor. The way they interact with each other is just spot on. I don’t say the acting is perfect lightly, but the acting is perfect. Is this the most entertaining film of the year? Not by a long shot. I want to see this again, but this isn’t something to pop on as a distraction. This is a fully engrossing film which requires attention and respect. I can’t wait to read up on it, let it all settle, and find this movie again after a few months or a year. This is required viewing for me now, when talking about film as art. For the first time ever through 370ish rankings, three bonus points. One for the cinematography (beautiful), one for the editing (textbook in its ability to draw emotion), one for the music (perfectly suited for the film utilizing a variety of styles). ~ by johnlink00 on May 8, 2012. One of the reviews I’ve been waiting for John. Tremendous piece of cinema indeed.